Heat the oven to 400°F. Beat the egg and water in a small bowl with a fork. Stir the walnuts, honey and rosemary in a small bowl. Unfold the pastry sheet on a lightly floured surface. Roll the pastry sheet into a 12-inch square. Place 1 cheese half, cut-side up, in the center of the pastry sheet. Spread the walnut mixture on the cheese. Top with the remaining cheese half, cut-side down. Brush the edge of the pastry with the egg mixture. Fold the pastry up over the cheese to cover. Trim the excess pastry and press to seal. Brush the seam with the egg mixture. Place seam-side down onto a baking sheet. Decorate the top with the pastry scraps, if desired. Brush with the egg mixture. Bake for 20 minutes or until the pastry is golden brown. Let stand for 30 minutes. 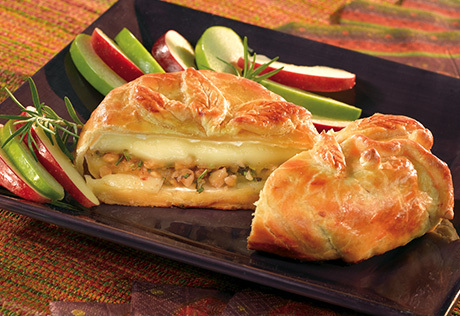 Serve with apple slices and French bread slices. Make Ahead: Assemble as directed but do not bake. Wrap in parchment paper and refrigerate for up to 24 hours or freeze for up to 1 week. To bake, heat the oven to 400°F. From the refrigerator, bake for 20 minutes or until golden brown. From the freezer, bake for 25 minutes or until golden brown. Let stand and serve as directed.